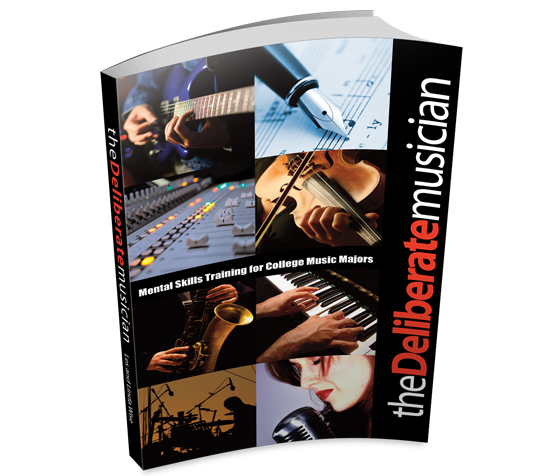 This is the first of its kind E-book Course developed specifically for College Music Majors. The E-book course teaches YOU how to dramatically improve your college experience. Confidence plays a big part in how well you play. In fact it is one of the single most important ingredients to your success. Sure talent and preparation are important but they go nowhere without confidence. Confidence is the fuel for your success; it powers you and affects every other aspect of your playing, performing and even your practicing. What undermines college music majors? But here is the good news… Musicians can learn how to take control of their self-confidence issues. When they do this, they experience great changes in their playing and performing. This step-by-step, E-book instruction course contains everything you’ll need to really make a change in your College experience from the Inside-out. Easy 6-Stage process makes it fun and easy to master the mental skills techniques. – Mark, Fort Wayne, IN. Learn how to overcome self-doubt and develop the positive self-talk and confidence of successful musicians. Recognize and refuse to listen to those negative outside sources who would bring you down. Discover effective, powerful techniques to become more confident and mentally tough no matter what you are playing or performing. Remove the mental roadblocks that have been keeping you from playing and performing the way you want. Do you want to play and perform better, but you find yourself NOT taking any Action to make it happen. As you release these limiting beliefs, you will become unstoppable! Our easy 6-Stage process will help you get there fast. How to easily and quickly focus on the now, eliminating all distractions. You’ll be able to stay focused in the moment. Your practicing and playing will become easy and fun again, not a chore. Step-by-Step you are guided through the process of handling all playing situations with ease and confidence.Imagine playing on stage and not worrying about how you are going to play, or what others think of you. Learn powerful techniques to deal with last minute Negativity and Self-Doubt. Unexpected things happen; it is just part of life. We all experience negativity and self-doubt, but it is how we respond to it that makes all the difference. You will learn surprisingly simple techniques to quickly move past any negativity and self-doubt. You will Discover new mental skills for enhancing Positive Thinking, Focus, and Concentration. You will start seeing results right away in all aspects of your life, not just music. 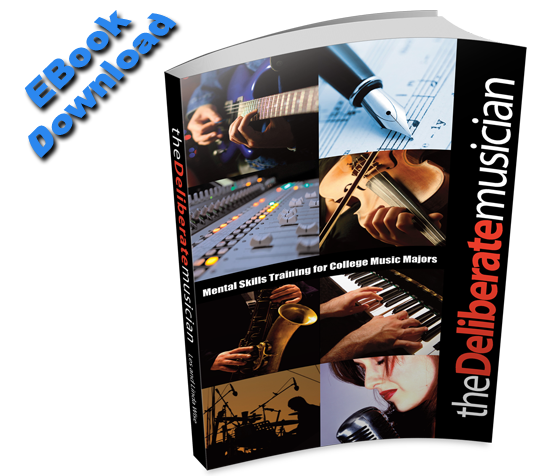 Upon placing your order using our secure server, The College Music Major E-book Course will immediately be available to download. Our 6-Stage process teaches you Everything You Need to Improve Your College Playing and Performing Fast! Every E-book has three parts: An Introduction, a REAL LIFE story of how a college musician client of ours overcame a problem or issue using our system. And last you are guided step-by-step through the 6-Stage process. Nothing is left out, everything is explained clearly in easy to understand terms. Outside Forces: What are the outside forces that are influencing how you see yourself as a person and as a musician? You will discover all of the tools and techniques you need to change your college life. No more fear, doubt and worry when you study for those college tests or perform in juries..
Inspiration and Motivation: Step-by-Step we teach you how to unlock the hidden power of your mind, to discover the best way to improve your college experience. We will reveal to you how to become inspired before taking action in your classes. Apply our deliberate process to move easily past Blocks and Plateaus. Learn simple but powerful techniques to quickly ramp up your Motivation. Music Student In College or Music School: If you are a college music major or plan on attending college, these lessons are for you. We explore the many aspect of being a college music major. What kind of schools to choose, and suggestions on how to find the money to get there. What type of practice you should be doing, and how to interact with teachers. How to manage the pressures of Auditions and Performances easily using our powerful techniques to create the experience you want. As you apply our proven 6 Stage process, you dramatically improve your grades and performances. YES – YOU CAN DO THIS! Thank you so very much for spending the time reading about “Mental Skills Training for Music Majors E-book.” We had a great time creating the E-book course, and are excited to share it with you. While we were working on the course we created some extra tools to speed up your progress, and we would like to give them to you as a bonus. Bonus #2 – “Music Success Log” A Music Success Log is a powerful tool to overcome our negative beliefs in our conscious and subconscious mind. Using the Music Success Log will help you keep track of your goals and eliminate old negative feedback. Bonus #3 – “Path To Clarity Worksheets” Path to Clarity worksheets help you quickly identify your musical goals and targets. These worksheets assist in discovering what you really want. Bonus #4 – “Practice Bonus Book” Practice bonus book teaches you how to apply our mental skill processes to practice situations such as what to practice, time management, self doubt and being more productive. 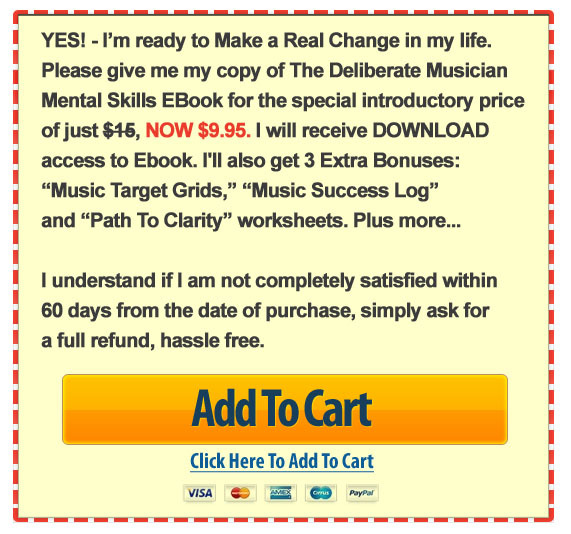 Bonus #5 – “Music Target Declaration” Included inside the E-book is a step-by-step method for creating a Music Target Declaration. This is a powerful tool to overcome our negative beliefs in our conscious and subconscious mind. Using the Music Target Declaration will help you think positively. Would you believe just $15 NOW $9.95 (33% OFF)?That is it! 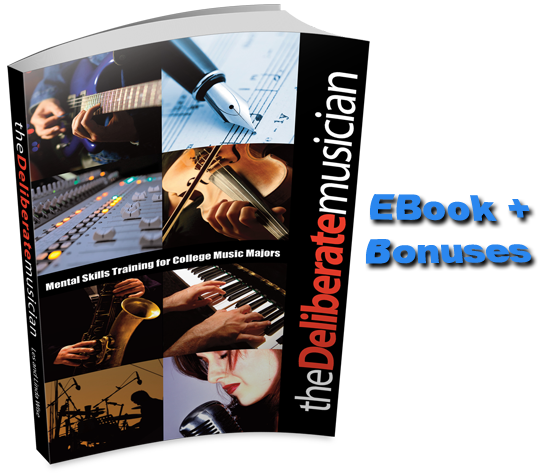 If you decide to invest in Mental Skills Training for College Music Majors E-book Course today, your investment is only $9.95. And to take all the risk out on your part, I am offering all this with a Hassle Free 60 Day Money Back Guarantee!!! You learn at your own pace. Music Success can be yours in just 20 Minutes a day. The concepts are absorbed easily and effortlessly. By Training your mind you can transform your results quite effortlessly! Did you know your mind controls your body (not the other way around). You have a full 60 Days to “Try” College Music Major E-book. If at any time you are not completely satisfied, you will receive a full and prompt refund, no questions asked. if you are not 100% Satisfied, we will refund you your purchase. How’s that?